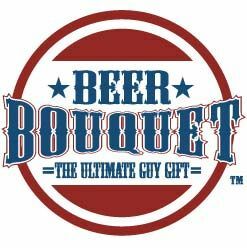 Beer Bouquet offers gift baskets that people will actually like to send/receive. We have ice buckets with any major sporting team logo (NFL, MLB, NBA, NHL, NCAA, NASCAR, Armed Forces, Seasonal, & Custom) paired with your choice of 14 major brand beers. write a little message and we will ship them out filled with great peanuts and other goodies.